The U.S. Capitol Visitor Center provides a welcoming and educational environment for visitors to learn about the unique characteristics of the House and the Senate and the legislative process as well as the history and development of the architecture and art of the U.S. Capitol. The visitor experience is an intellectual and emotional encounter comprised of highly personal moments that inform, involve and inspire those who come to see the U.S. Capitol. Beneath the East Front plaza of the U.S. Capitol at First Street and East Capitol Street. Monday through Saturday except for Thanksgiving Day, Christmas Day, New Year's Day and Inauguration Day. Visitors with official business appointments may enter as early as 7:15 a.m. The United States Capitol is a monument, a working office building, and one of the most recognizable symbols of representative democracy in the world. Visitors are welcome to enter the building through the Capitol Visitor Center, located underground on the east side of the Capitol. 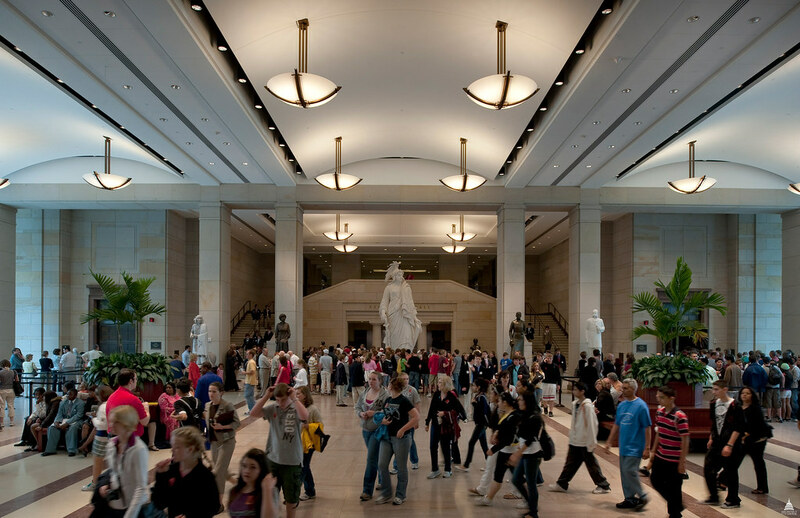 The U.S. Capitol Visitor Center provides an increased focus on visitor comfort, safety and security resulting in a seamless, positive visitor experience at the U.S. Capitol. Visitors can begin their Capitol experience at the Visitor Center by visiting the Exhibition Hall, perusing the Gift Shops or dining in the Restaurant. There are also a number of special tours and activities offered beyond the general tour of the Capitol Building. All visitors wishing to tour the Capitol start at the Capitol Visitor Center. The U.S. Capitol Visitor Center is the newest addition to the historic Capitol Complex. At nearly 580,000 square feet, the Visitor Center is the largest project in the Capitol's more than two-century history and is approximately three-quarters the size of the Capitol itself. The entire facility is located underground on the east side of the Capitol so as not to detract from the appearance of the Capitol and the grounds designed by Frederick Law Olmsted in 1874. Since opening on December 2, 2008, the anniversary of the placement of the Statue of Freedom atop the Capitol Dome in 1863, millions of people have visited the Capitol, entering through the Capitol Visitor Center. From its inception, the Capitol Visitor Center was conceived as an extension of the Capitol. The materials used to construct the Visitor Center were selected to match the colors, textures and materials seen throughout the historic building. This care is evident in Emancipation Hall, named to recognize the contributions of the enslaved laborers who helped build the U.S. Capitol, the central gathering place for visitors coming to see the Capitol. Rising 36 feet above the floor, the walls and columns of Emancipation Hall are lined with sandstone slabs marked by a variety of color and texture similar to the sandstone seen in the Capitol. Also in Emancipation Hall visitors can see the plaster model of the Statue of Freedom, 18 of the statues donated to the National Statuary Hall Collection and the POW/MIA Chair of Honor. There are two orientation theaters in the Capitol Visitor Center where visitors will start their tours of the Capitol by watching a 13-minute orientation film that introduces them to the Capitol and illustrates how government was initially established in the United States. There are also two small theaters in the Exhibition Hall where visitors may watch the proceedings in the House and the Senate chambers. The Exhibition Hall, where visitors may explore the only exhibition in the world dedicated to telling the story of Congress and the U.S. Capitol, is 16,500 square feet. Highlights include rarely seen historic documents from the National Archives and the Library of Congress, artifacts from around the country, and an 11-foot-tall touchable model of the Capitol dome. There is a 530-seat restaurant in the Capitol Visitor Center serving soups, salads, entrees and a variety of other items. There are also two Gift Shops in the Visitor Center. For more information about the U.S. Capitol Visitor Center, please go to visitthecapitol.gov.